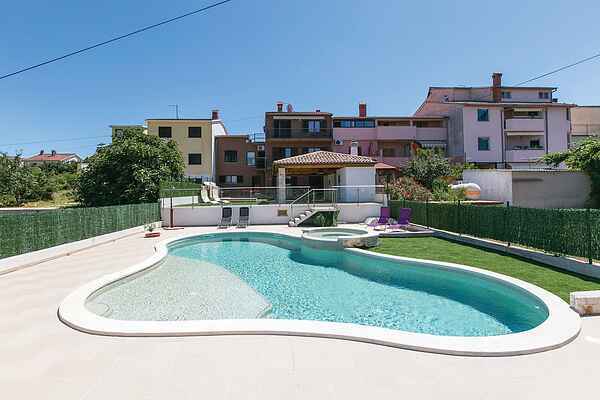 This spacious holiday home with private swimming pool and jacuzzi is situated in Valbandon, on the well-known Riviera Fažana. Fažana town centre is 3 km away, from this town you can also reach Brijuni National Park by boat. The historical city of Pula, in which you can find a Roman amphitheatre among other things, is 6 km away. At walking distance from your holiday home you'll find a restaurant, a coffee bar and a small grocery shop. Holiday home Sole can house 12 people and consists of three apartments. You'll have the use of the enclosed garden with private swimming pool and jacuzzi, a covered terrace and an outdoor kitchen with dining table. No need to go anywhere if you don't want to! The basement is fitted out with a fully equipped kitchen with dining area and fireplace, a bedroom and a bathroom. On the ground floor is a second kitchen with dining area, living room with access to the balcony, two bedrooms and a bathroom. On the first floor is a third kitchen with living area, two bedrooms and a bathroom. The bedrooms on the first floor have air conditioning. All bedrooms on the ground floor and first floor have access to the spacious balcony with garden furniture.